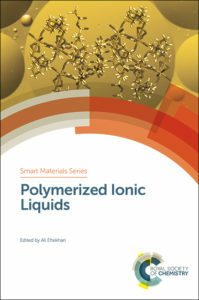 With the publication of Polymerized Ionic Liquids edited by Ali Eftekhari, the Smart Materials Series sees the milestone publication of 30 books in the series. Led by Series Editors Hans-Jorg Schneider and Mohsen Shahinpoor, the series provides students and researchers with the fundamentals and applications of different smart materials from renowned international experts. Since the publication of its first book in 2012 on Janus particles, the series has gone on to cover hot topics from smart materials for drug delivery and tissue engineering to opto-electronics and environmental applications. View all 30 titles in the Smart Materials Series. Don’t forget you can freely access the table of contents, preface, front matter and first chapter of every eBook in the series. If you have an idea for a book in the series or just want to know more then please contact Commissioning Editor Leanne Marle. Attending this year’s Fall MRS Meeting? View our latest materials science books on display at the Royal Society of Chemistry stand #222 and meet the materials science Commissioning Editor Leanne Marle to find out more about our books programme. Meet the Editor-in-chief for the Nanoscience & Nanotechnology Book Series Paul O’Brien CBE FREng FRS on the stand between 2.30pm-3.30pm on Wednesday 30th November. The RSC Polymer Chemistry Series are celebrating the publication of 20 books in the series with the publication of Polymers for Personal Care Products and Cosmetics by Xian Jun Loh, Institute of Materials Research and Engineering, Singapore. With contributions from leading international experts, each book in the series covers key themes in polymer chemistry research providing the perfect introduction for graduate students and researchers. View all 20 titles in the RSC Polymer Chemistry Series. Don’t forget you can read the table of contents, preface, front matter and first chapter of the eBooks in the series for free. 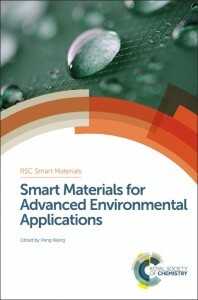 With the publication of Smart Materials for Advanced Environmental Applications edited by Peng Wang, we celebrate publishing 20 books in the RSC Smart Materials series. Led by Series Editors Hans-Jorg Schneider, Universität des Saarlandes, Germany and Mohsen Shahinpoor, University of Maine, USA, the series covers the fundamentals and applications of different functional material systems from renowned international experts. The first book in the series was published in 2012 on Janus Particle Synthesis, Self-Assembly and Applications edited by Shan Jiang and Steve Granick, since then the series has continued to cover key topics such as opto-electronics, smart materials for drug delivery and chemoresponsive materials. View all 20 titles in the RSC Smart Materials series. A new textbook on Stimuli-Responsive Materials by Marek W Urban – coming soon! Covers the current knowledge and methods used to control living organism responses to implantable devices. The book discusses the basic principles of building supramolecular organic systems that fulfil the requirements of the targeted opto-electronic function. Discusses how nanostructured materials can be applied to energy devices, with an emphasis on the process of generation to storage and consumption. Details the synthesis, characterisation, properties and applications of poly(lactic acid) science and technology covering scientific, ecological, social and economic issues. A comprehensive overview of the recent accomplishments in the area of polyhydroxyalkanoates. This book covers the synthesis of useful products and intermediates from plant oils. Attending this year’s Fall MRS Meeting? View our latest materials science books on display at the Royal Society of Chemistry stand #1301. 12th International Conference on Materials Chemistry (MC12), 20 – 23 July 2015, University of York, UK – abstract submission is now open! You can now keep up-to-date with the latest books published from the Royal Society of Chemistry with our eBook Table of Content Email Alerts. Sign up today by selecting RSC eBook Collection in the Book Alerts section on the Email Alerts Service Form. 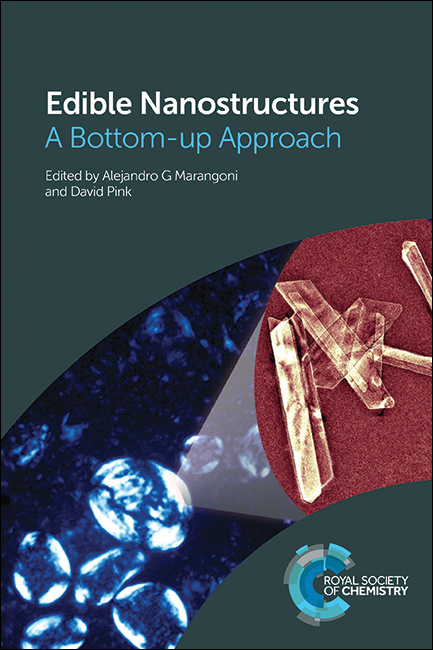 Edited by Alejandro G Marangoni and David Pink, University of Guelph, Canada this new textbook on Edible Nanostructures provides an introductory background to different nanostructures used in food. Specific systems discussed include fat nanostructures, polysaccharide nanostructures, protein nanostructures, lipid mesophase nanostructures, self-assembled fibrillar networks of low molecular weight oleogelators, and nanoemulsions. Separate chapters also look at imaging nanostructure and computer simulation techniques for modelling statics and dynamics of nanoscale structures. Don’t forget Royal Society of Chemistry Journal Authors and Referees are eligible to receive 25% discount on Royal Society of Chemistry print books. Contact the books team to get your discount code. Members recieve 35% Discount on Royal Society of Chemistry print books – order the books directly from the website and enter your membership number at the checkout. In-depth and specialised – each textbook provides much more than a simple overview of the topic. Evidence-based – Building on the foundations of theoretical science, our textbooks explore chemistry in the real world. Practical applications – Our books concentrate on applied chemistry – making them the perfect companion to traditional textbooks that may not extend to practical applications. You can now keep up-to-date with the latest books published from the Royal Society of Chemistry by signing up for our eBook Table of Content Email Alerts. Receive the Table of Contents for every new eBook published including the direct links to the chapters – all visitors have free full access to the table of contents, preface, front matter and first chapter of every eBook with their personal RSC Publishing Account. Sign up today by selecting RSC eBook Collection in the Book Alerts section on the Email Alerts Service Form. Can’t wait to find out what we’re publishing? If you want to find out in advance about our new book releases sign up to our Advance Book Information (ABI) Email Alert. You’ll receive news of all the books being published 6 months ahead of their planned publication date. Sign up by ticking Advanced Book Information in the Book Alerts section on the Email Alerts Service Form. Don’t forget you can also keep up to date about our new books by following @RSC_Books on Twitter or via the RSC Books Facebook Page. As the world considers the rightful usage of fracking in providing a new source of energy, learn more about this hot topic with our latest Book. The obtaining of fossil fuel reserves by hydraulic fracturing, or “fracking,” has generated a debate that shows no sign of abating. 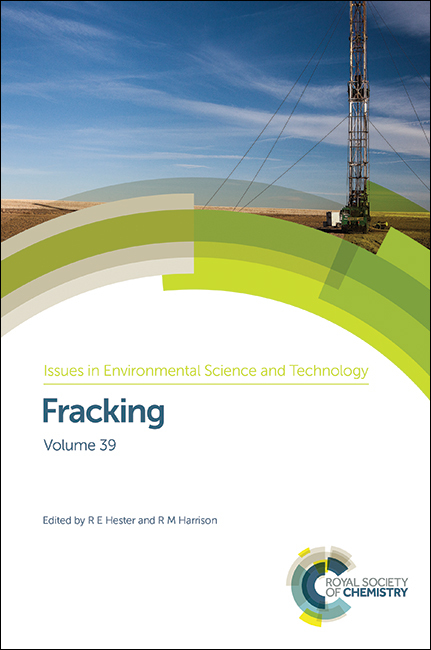 Fracking, Volume 39 in the Issues in Environmental Science and Technology Series edited by Ron Hester and Roy Harrison, presents a critical but balanced account of developments in the technology, economics, environmental and health concerns of fracking. Aimed at students, professionals and all those concerned with energy policy development, this book will be a valuable resource for anyone looking for a two-sided, comprehensive analysis of the topic. Discusses the diverse range of materials and fabrication methods now available to take photovoltaic systems into the third generation. N ew titles in Issues in Environmental Science & Technology edited by Roy Harrison and Ron Hester. Don’t forget all these books are also included within the RSC eBook collection, which is accessible and fully searchable via the RSC Publishing Platform. All visitors have free full access to the table of contents, preface, front matter and first chapter of every eBook with their personal RSC Publishing Account.